While December should be a phenomenal time we enjoy with our family and friends, often it can be a highly stressful time for many of us. December is typically full of parties and food and tons of things to get done, but that doesn’t mean we have to go through the month feeling overwhelmed. Ultimately, that overwhelm leads to stress, stress eating, and out-of-whack emotions. Ladies, it truly does not need to be this way. Here are a few tips to help you stay stress free and in control over the next 4 weeks. While most of my tips have to do with health and nutrition, my first tip doesn’t, so bear with me. Tip #1: Limit your time with toxic family members. I know this might feel impossible to do; you likely feel obligated to spend time with family members, even though you know they are not good for you or your family but here’s the thing, you are a big girl. You get to decide who you spend time with. Over the last year, Brandon and I have decided to be extremely intentional about the the people we allow into our lives and into our holidays. This decision has led to some of the best holidays we’ve ever had. Toxic people are like crabs. When a cage with some food is thrown into the water, one crab will usually go to the cage to get the food. Soon, the rest of the crabs follow the first one into the cage, even though the food is already gone. Some of the crabs will try their best to get out of the cage, through the open top, but the crabs on the bottom of the cage will actually pull them down, often killing them in the process. Sounds pretty grim, huh? Well, this is often the effect toxic people have on those around them. They seek to bring everyone down with them. My first tip for remaining stress free is to choose who you invest your time with; time is your most valuable commodity. Alright, let’s get into the health and nutrition stuff. Tip #2: Enjoy treats on the holidays. Notice I didn’t say to enjoy treats every day between Thanksgiving and New Year’s Day. However, that is when most of my clients gain weight. Because of all the parties and treats that are available during the month of December, we often end up eating more than we need to fuel our workouts. While I wholeheartedly believe you should not deprive yourself of things you love during the holidays, it is important that you are extremely intentional about when and why you enjoy those treats. Choose the ones you love the most, and have at ‘em on the actual holidays! Make sure that you are mindful of your eating during the rest of the month. Also note that having processed foods around during this season can really affect your emotional state of being. Eating clean will help you feel emotionally stable, happier and more level headed, which will be key to keep stress at bay during the holiday season. Tip #3: Be sure you are getting enough sleep. I know firsthand how hard this can be. However, it is so important for maintaining low stress levels. Some things that have helped me find a good sleep pattern are: going to bed at the same time each night, keeping my room cool and dark, and limiting screen time prior to bed. Another thing that has helped me dial in a healthy sleep cycle is waking up at the same time every morning. I know that these things are not always possible, but sleep cycles are extremely important in regulating hormone levels. Those hormone levels are directly related to your stress levels and whether or not your body is storing fat or burning fat. So do your best to get into a good sleep habit. It will go a long way in helping you feel in control through the month of December. Tip #4: Continue workouts, but slow down if you need to. Do your best to workout consistently through the month of December, but do not be afraid to scale back a workout if you’re having a particularly stressful day. Undoubtedly, there will be a few bumps in the road where you come up against stressors. When that happens, it’s really important you listen to your body and ease up on your workout. If you are feeling incredibly stressed, and go all-out for an intense workout, you are going to increase your cortisol levels when they are already elevated. That will make losing belly fat all the more difficult. Plus, there are times when your body just needs a break. Be sure that you are listening well to what your body is telling you, and then give it what it needs. The month of December can be overwhelming, but it doesn’t need to derail you from pursuing your health and fitness goals. While you may need to do some things a little differently to keep your stress levels low, it is entirely possible to feel in control and truly thrive during the holiday season. Is Your Gut Keeping You From Burning Fat? Have you been eating clean and killing it at the gym but feel like you’ve hit some kind of fat loss plateau? If so, your gut health might be out of whack! While a clean diet and intentional workout plan are critical for fat loss and better body composition, there is one factor related to burning fat that is often overlooked and that’s gut health. Gut health is basically the ecology and structure of your gut and how it functions within your environment. Our body is one big microbiome! All of our genetic elements and all of the organisms living in and on our bodies make up that microbiome and while most of us believe that we are no more than our genetic makeup, that is simply not the case. We only have about 22,000 genes in our chromosomes but we have 3.3 million microbial genes which means we have considerably more bacterial DNA in our bodies than we do genetic DNA. Why is gut health important for weight loss and burning fat? Our guts are full of two types of bacteria. When you have higher levels of one type of bacteria, you become a lean, fat burning machine with improved insulin sensitivity. When the other bacterial level is higher, you tend to put on weight faster, have more cravings, and it becomes difficult to build lean muscle. Not having enough of the right bacteria in your gut can really affect your results over time. The most effective way to improve the ecology of your gut is to take probiotics. While you can get probiotics from foods like yogurt, kimchi and sauerkraut, there are also several supplements available that can help you improve overall gut health; however, not all probiotics are created equal. The strain of bacteria is what is most important in choosing a good probiotic. If something needs to be refrigerated, then it is likely the strain in that probiotic is not strong enough to withstand your digestive process. How does getting our gut healthy help us burn fat over time? When you are taking probiotics, the good bacteria start competing with the bad bacteria for food and space within your gut. This inevitably decreases the levels of bad bacteria while increasing the levels of good bacteria in your gut. The good bacteria found in probiotics break down carbohydrates and fiber and convert them to Short Chain Fatty Acids (SCFA’s). SCFA’s also turn on the genes in your body that cause you to burn fat and tell your body to store less of it. Ultimately, you will feel fuller for a longer period of time and decrease your ghrelin levels which will help control your hunger. Basically, probiotics give your gut the good bacteria it needs to start resetting the ecology of your body. You can diet and do all the right things, and still not see results if your gut health isn’t where it needs to be. Aren’t genetics responsible for metabolism? You are genetically predispositioned to a certain type of body type but your behavior determines whether you are going to remain lean or gain weight. The idea of a fast metabolism is a bit of a misconception. While you can increase your metabolism, your body’s rate at which it burns calories, there’s much more to a ”fast metabolism” than you might realize. When you have more of the good bacteria in your gut, your gut is actually harvesting less calories from the food you eat than someone who has more bad bacteria in their gut. A meal with 2000 calories can be absorbed differently in one person than in another: with one person absorbing only 1200 calories and the latter absorbing all 2000 calories. Clearly, you see how this could play a role in weight gain and weight loss. How long before I see some results once I’ve started using a probiotic? On average it takes about 2 weeks to begin seeing some change when using a probiotic. In addition to seeing your body become more efficient at fat burning, you will likely also see an improvement in bloating, pressure and your overall immunity. Those changes will likely be visible sooner. Until you reach your goal weight, you will want to use your probiotic daily. Once you’ve reached your goal weight, you can begin to ease off your probiotics one day at a time until you are taking the probiotic about three times a week. Over time, the good bacteria will be more prevalent in your gut than the bad, and your gut ecology will change, which means your body will become more efficient at burning fat. It is important to note that a probiotic is only effective at helping you burn fat when combined with a clean diet and a rigorous exercise plan. You can’t sit on the couch eating Cheetos, taking a probiotic every day and expect to drop 20 lbs. However, if you have been eating clean and exercising, but seem to have hit a plateau, you might want to look at investing in a good probiotic! It could be what you need to get your body back on track. For years I lived by the diet and exercise advice the fitness gurus swore by: several mini-meals throughout the day, a regular low caloric intake, and long form cardio. While I found myself in decent shape, there came a time when I hit a plateau. I couldn’t quite find my six pack, I didn’t have a ton of energy and I found myself getting sick a little too often for my liking. So, I did a little research and began experimenting with intermittent fasting and carb cycling. In addition, I changed up my workout and added in some serious strength training and HIIT. I can honestly say that I have never looked or felt better. Because of the amazing results I saw with this combination of nutrition and workouts, I created what has now become my FASTer Way to Fat Loss for women who have reached a similar type of plateau. Today, countless women have seen significant results in terms of fat loss, energy levels, overall health and confidence. This is an upper level strategy. If you are someone who needs to lose 100lbs, or who has not been physically active for years, then this is not the place to start. This type of program does require a good bit of intentionality and commitment. However, I promise it isn’t as scary as it may sound. If you have reached a weight loss or body composition plateau and are truly committed to doing some work to see a change, this is likely a fantastic option for you. Long term restriction of carbohydrates and calories can lower your metabolic rate and negatively affect your hormone levels. This is a big reason women find themselves at one of those weight loss plateaus. For a short period of time a significantly restrictive diet will bring you results. However, over time it will cause your metabolic rate to decrease. Once that happens you will see your weight loss stop and will need to restrict even further to lose more, thus lowering your metabolic rate once again. Not only is this a terribly unhealthy way to live, it is also incredibly frustrating. There’s actually a lot more but I realize that this might seem like a lot to think about. However, once you really understand this cycle and process, it is a truly simple lifestyle to live. My clients have seen amazing results from an intentional combination of carb cycling, intermittent fasting and effective strength training workouts. You don’t need to figure this out yourself, I’ve already done it for you in my FASTer Way to Fat Loss program. This program is truly the best program out there. I have literally helped hundreds of women find their six packs, increase their energy levels, feel in control of their food choices, and find more confidence than they’ve ever had before. If you are interested in joining my FASTer Way to Fat Loss program, it would truly be my pleasure to work with you. Visit the FASTer Way to Fat Loss information page to sign up today. We will begin prep week on January 2. Weight loss alone will not give you a fit, lean look. That requires losing fat while building lean muscle. However, the process of building muscle while burning fat is a tricky one. It truly is a balancing act that requires intentionality. Here are 5 tips that will help you build muscle and burn fat, giving you a lean, toned, fit look. 1) Eat the right macros, at the right time, for the right reasons. If you’ve never heard the term macros, it’s short for macronutrients: carbs, fat and protein. In order to build lean muscle while burning fat to get lean, you need to track your macros. This doesn’t need to be an overwhelming thing that causes you to obsess over everything you eat. Instead, tracking macros helps you focus on fueling your body for your workouts (the right reasons). In addition to that, implementing Intermittent Fasting (eating at the right time) will help your body burn fat more efficiently. This isn’t as scary as it sounds, but it is an important component to getting lean. 2) Lift heavy to develop lean, calorie burning muscle. In order to build muscle you have to lift heavy weights. Muscle growth happens when you progressively overload your muscles, forcing them to adapt and grow. When the muscles are being overloaded they will burn significant calories during your workout. The work you are required to expend during your workout will require repair after your workout, which means you will burn calories for hours after your workout is over. This kind of muscle building will not make you look big and bulky. Instead, it will help you look lean and strong. To do this effectively you need an intentional workout plan. This will also require that your diet be dialed in: specifically your protein intake. When combined with a strategic weight training program, cardio done in the fasted state will require your body to reach into its fat stores to start burning fat for energy. In addition, a well-planned HIIT workout will not only burn tons of calories during the workout, but will burn calories up to 48 hours after your workout has finished. Our gut health is directly related to our immune system and metabolism. Supplementing a well designed workout and nutrition plan with effective probiotics will help you shed more fat, while helping your build lean muscle. Probiotics aid your body in the production of Short Chain Fatty Acids or SCFA’s. SCFA’s aid your body in burning fat while telling your body to stop storing fat. The more efficiently your body produces them, the more you will see the lean muscle you are building, specifically around your midsection. Building lean muscle while burning fat takes time. Staying off the scale and looking for non-scale victories will go a long way in relieving stress and getting results. People who stay positive throughout a fitness program have greater long-term success than those who don’t. In addition to staying positive, the simple act of thinking about what you are grateful for has been shown to decrease cortisol levels by 23%. Cortisol levels plays a significant role in the way your body stores and burns fat. An effective program will have a mindset component added to its nutrition and fitness plan. If you want to get lean, you need to build lean muscle and burn fat. While doing both of those things at the same time can be a challenge, these 5 strategies will help you do that dance well. For the past several months I have built the very best program out there to help you burn fat and get lean. I’ve incorporated all of these things into my FASTer Way To Fat Loss Program. Hundreds of women have gone through the program and have seen truly amazing results. My FASTer Way to Fat Loss Program takes ALL of the guess work out of getting lean. It provides you with the support and programming you need to be successful. Registration is open for my last FASTer Way to Fat Loss Program of the year. The program begins November 28th, and slots are filling up fast. I am so confident in this program and its ability to help you get lean, that I offer a money back guarantee. To join me, and the hundreds of other women who have seen success through this program, SIGN UP HERE. 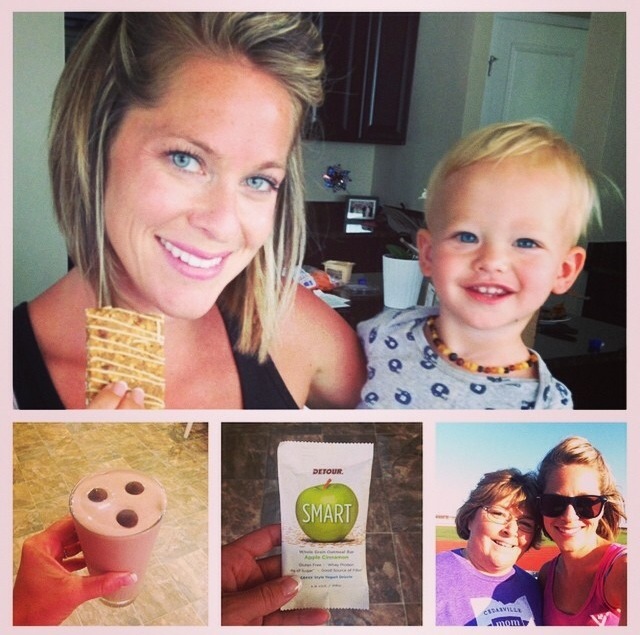 Detour Bar: Healthy, Tasty, Easy to Pack, and Toddler Approved! The following post is sponsored by FitFluential LLC on behalf of Detour Bar. Several times this summer, my gym and online personal training clients have asked me for granola or protein bar recommendations. Unfortunately, there are not many options that I can give them for an easy, and healthy summer snack bar! Granola bars are often extremely high in sugar and processed items that we simply do not need in our bodies. In fact, granola bars packed with insoluble fiber and other ingredients often cause me major bloating and discomfort. I was thrilled when I was presented with the opportunity to review the Detour Bar — a healthy, tasty, easy to transport, and toddler approved option. The Detour Bar is gluten-free, high in protein, and only has 135 calories! It’s all natural and sweetened with stevia. I often need quick energy before a boot camp or client workout — this bar was perfect for a fast snack that gave me a boost of energy. Oh, and did I mention it tastes amazing? I received the bars in the mail last week and they were gone within a couple of days thanks to two little kiddies that couldn’t seem to keep their paws out of the pantry. And don’t you just love a healthy snack that is easy to grab and go for your toddlers? Be sure to check my IG page tonight (@fitparnering) because I may just be doing a giveaway for these bars! 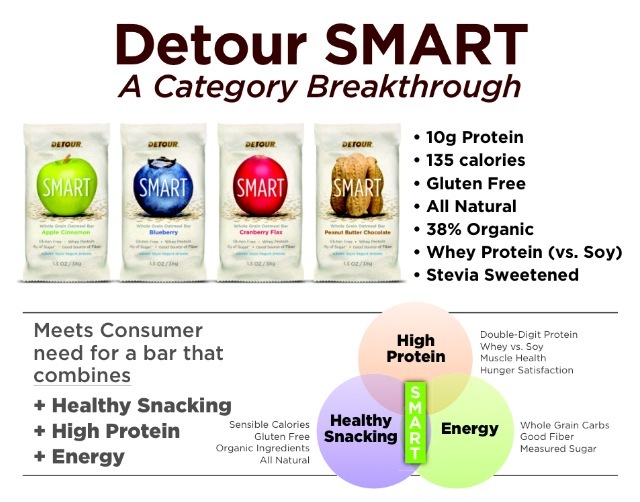 Visit the Detour Bar site for more information about their products, a resourceful blog, and to stay in-the-loop on promotions. Also be sure to like the Detour Bar Facebook page and follow them on IG and Twitter (@detourbar). Pic on the left is 6 years ago, and photos on the right are this past weekend. Happy Monday! I hope you had a great weekend with your families and are enjoying a fabulous start to the week. We were in the pool for most of the weekend, and it was wonderful! This past week, I started an in-person boot camp in town. I led one last summer starting two weeks after Baby Cole was born, and it was a TON of fun. I have already really enjoyed getting to know the ladies in the boot camp, and I can’t wait to see their results. Like my online boot camp program, we are combining effective HIIT workouts with some running, and proper nutrition. I am following the eat clean challenge that I created with my online and in-person boot campers, and I feel SO good. Honestly, even after delivering two babies, I believe that I am the healthiest I have ever been. Here is a photo (left) from 6 years ago before I had any babies or the stresses of my own company and a house to manage, and two photos (right) from this past weekend. It IS possible to be fitter and more healthy AFTER having babies. A huge part of my personal wellness plan includes a clean, whole foods, balanced approach to my food intake. 6 years ago, I was careful to “count calories,” but not necessarily eat the nutrient dense foods that my body needed to fuel my workouts. Now, I don’t count calories at all or measure portion sizes, macros, etc. I eat clean, whole foods to satisfaction. The chocolate coconut almond bars were SO delish. My current food intake is a high veggies, high protein, high [good] fats plan. 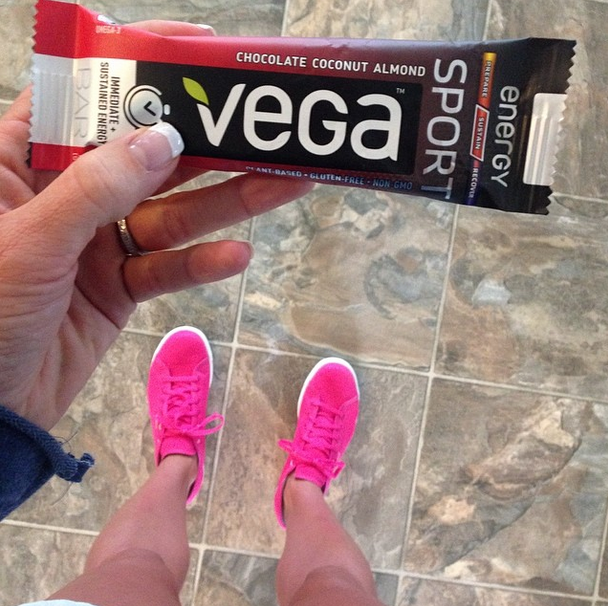 Recently, I had the opportunity to taste-test the Vega Sport Energy Bars as part of a SweatPink and Vega Sport Fuel Your Better campaign. The box I received was chocolate coconut almond. Oh my goodness … SOOOOO delish. I am a sucker for anything chocolate and almond, and adding in the coconut gave the bars a perfect taste. Formulated by Brendan Brazier, professional Ironman triathlete and bestselling author on performance nutrition, Vega Sport Energy Bar is part of the three-stage Vega Sport Nutrition System. Visit the Vega Sport Fuel Your Better to learn more about how to properly fuel your body for workouts. The site is fabulous and very informative. It covers the topics of motivation, overtraining, stamina, muscle burn, and the importance of proper fueling. I am so thrilled that I had the opportunity to taste-test the Vega Sport Energy Bars, and I definitely recommend that you try them as well! Enjoy.